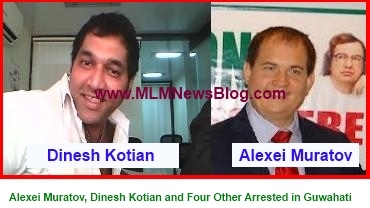 GUWAHATI: Alexei Muratov, Danis Rosaov and Andre Kilyn along with Dinesh Kotian, Rimish Balan and Nabajit Das, a local agent were arrested in Guwahati by the local police in connection with MMM India Fraud. Local police of Guwahati booked them under the Prize Chits and Money Circulation Schemes (Banning) Act, 1978 and sections 120 (B), 406, 420 of the IPC. Guwahati police is also thinking of charging them with IT Act sections. The police acted after a complaint was filed by Kunal Kishor Singh, who has registered a fraud case against MMM India. During the interrogation it was revealed that in Punjab itself they have duped investors of Rs 15 crore. At the time of interrogation, all suspects said that they are not involved with any investment schemes. They said ” MMM India is a mutual-aid fund”, where people help each other by pooling money. This is a first arrest in the case of MMM India.